Over medium heat, melt 2 tablespoons of the butter in a saucepan. Add chopped onion, carrot, celery and garlic. Cover and increase heat to medium-high. Cook stirring occasionally until vegetables begin to brown, about 5 minutes. Sprinkle the flour over the vegetables and stir over low heat for about 1 minute or until flour is fully incorporated. 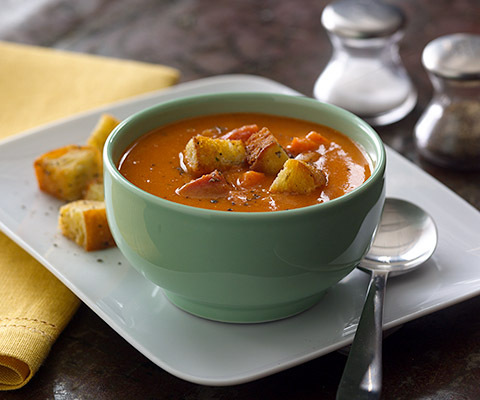 Add the vegetable stock, diced tomatoes, tomato paste, sugar and Classico® Four Cheese Tomato Cream Sauce. Bring to a low boil. Cover partially and cook over medium heat stirring occasionally until vegetables are tender, about 15 minutes. Transfer half of the soup to a blender and puree until smooth. Return the puree to the saucepan, add the heavy cream and heat for another 5 minutes, until soup is just heated through. Season with salt and white pepper to taste. Stir the remaining 2 tablespoons of butter into the soup. If desired, garnish with cheese or garlic croutons.